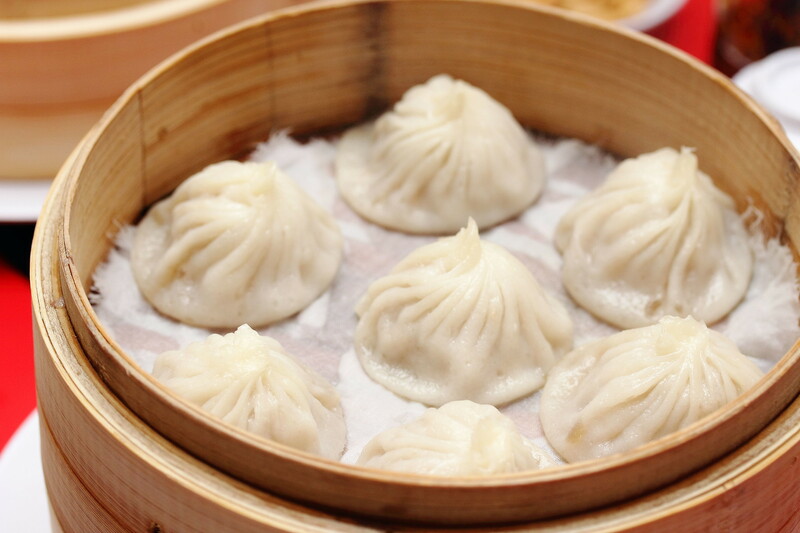 Since 1989, Jing Hua Xiao Chi (京华小吃) has been delighting its guests with dishes made with original, home-style recipes created by founders Mr and Mrs Han. 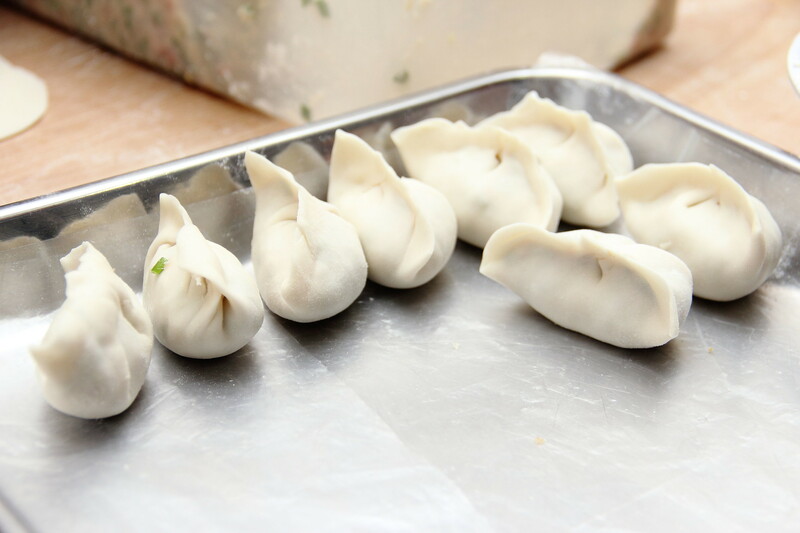 Jing Hua Xiao Chi renowned for its delicious homemade dumplings is celebrating its 25th anniversary this year at Neil Road. 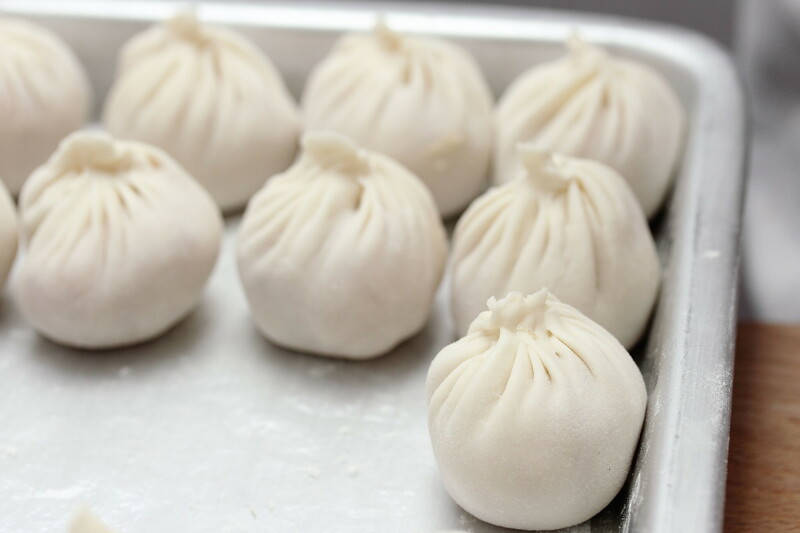 I have the chance to experience making Jing Hua's famous "Little Juicy Steamed Meat Dumplings" (Xiao Long Bao) and "Mixed Seafood and Pork Dumplings" (Jiao Zi) first-hand from Han Guo Guang, the second generation who has helmed the family business. Never thought I would ever get the chance to make my very own “Little Juicy Steamed Meat Dumplings”小笼汤包. What a pleasant surprise when I realised that this was the place where I had my very first little juicy dumplings almost 10 years ago. Way before this dish becomes so ubiquitous in Singapore. We first started off with "Mixed Seafood and Pork Dumplings". 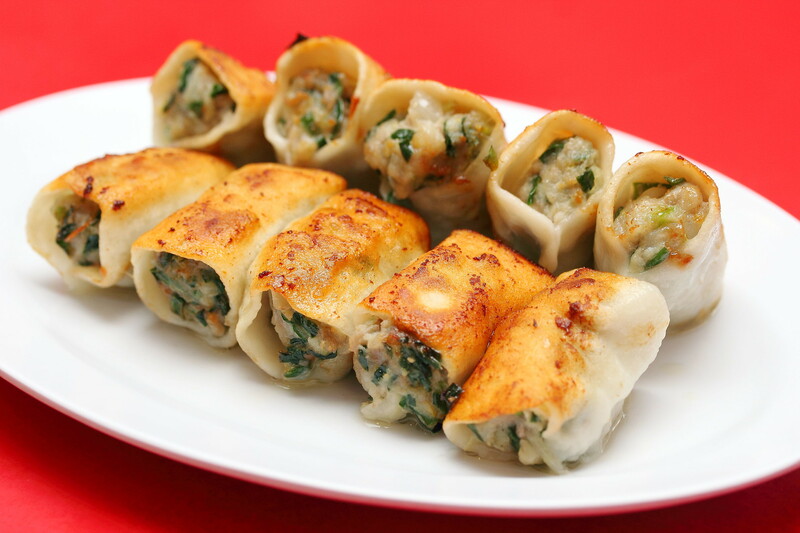 The filling consists of crab meat, prawn meat. pork and chives. The key point to note is that the closing top musn’t have too much of the skin, which may result in a too doughy texture. And, many may not be aware, you must curve the top when closing the gap so that it is "smiling" to its guests. Next is the making of the Xiao Long Bao. I pulled, twisted and pinched... voila! My very first Xiao Long Bao emerged. Beginner luck I supposed because the subsequent ones failed terribly. After all the "hard work", it was time to harvest our effort. 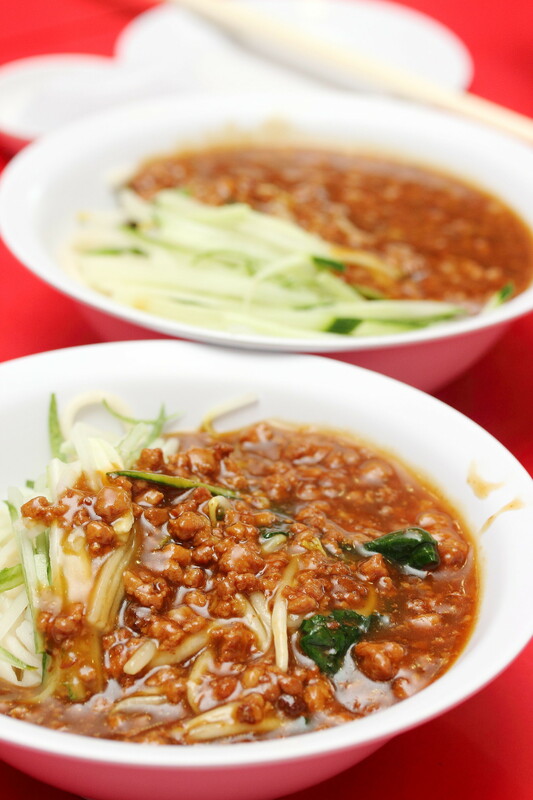 We began with something substantial, the Noodle with Minced Pork & Soya Bean Sauce ($5++). A slight variation from the usual ones I had before. There is crushed peanuts mixed with the minced meat sauce, hence, carrying a slight resemblance with our local Satay Bee Hoon. Personally I prefer those without the peanuts and I thought the noodles could be springier as well. Then our masterpieces came. Mixed Seafood and Pork Dumplings ($8++ for 10 pieces). Guo Guang prepared both ours and theirs for our tastings. Ours were seemingly in odd shapes whereas theirs were more structured. I love how juicy it was without an overpowering pork taste which some do. The top wasn't too doughy hence you won't end up with a flat flour taste when biting on the closing. Next, we had Pan Fried Mixed Seafood & Pork Dumplings ($8++ for 10 pieces). The presentation of it didn't change at all since 10 years ago, just that it got bigger. 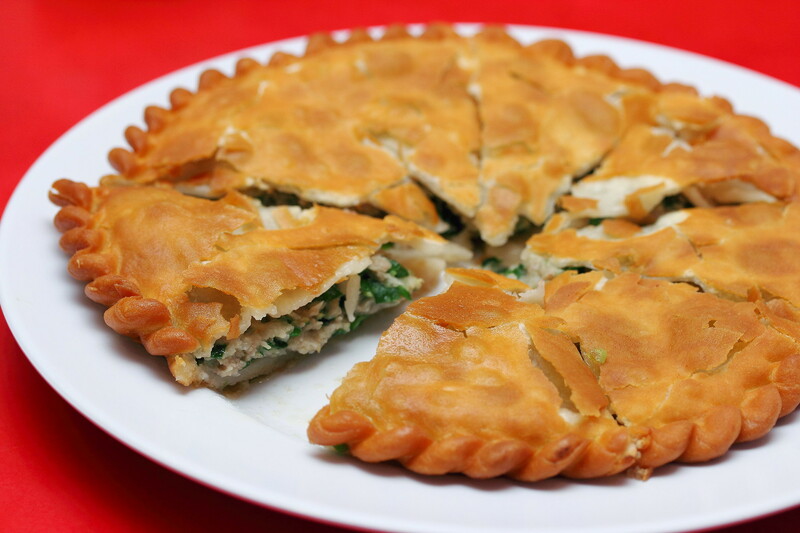 With its 2 tails opening, the generous filling that was almost overflowing from its thin crispy skin, beckoned to us. However, as much as I was delighted by the portion of the meat, I felt a fully wrapped dumpling would have been juicer with its juice being locked in during the pan-frying process. If my memory didn't fail me, that was my thought 10 years ago as well. And what many of us were anticipating for, their famous Little Juicy Steamed Meat Dumplings ($7++ for 7 pieces). We were being served our masterpieces and theirs for comparison. Again, theirs looked more structured than ours. And one look at it, I knew it had enough broth to envelop my taste buds. As I held it against the sunlight, I could see it surfacing to almost half of the dumplings through its thin translucent skin. 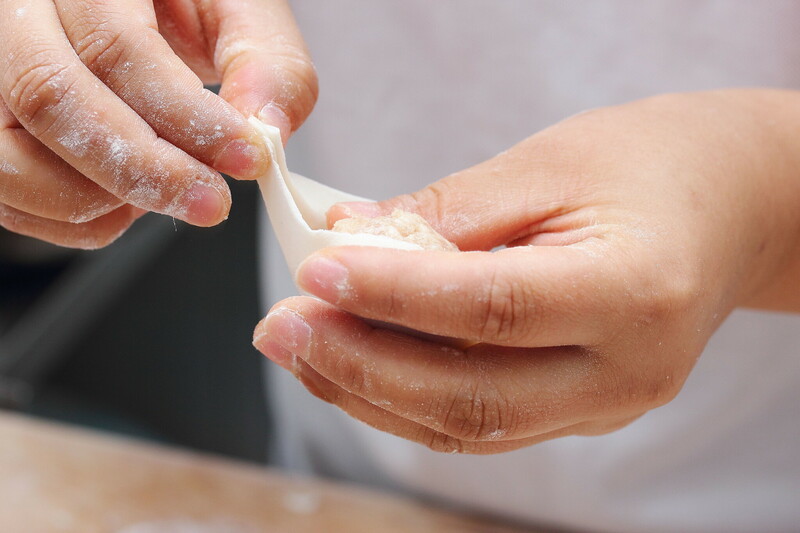 We were taught how to pick up a dumpling successful. The trick is to wet the tip our chopsticks first prior to picking it up to prevent the tip from sticking to the skin. 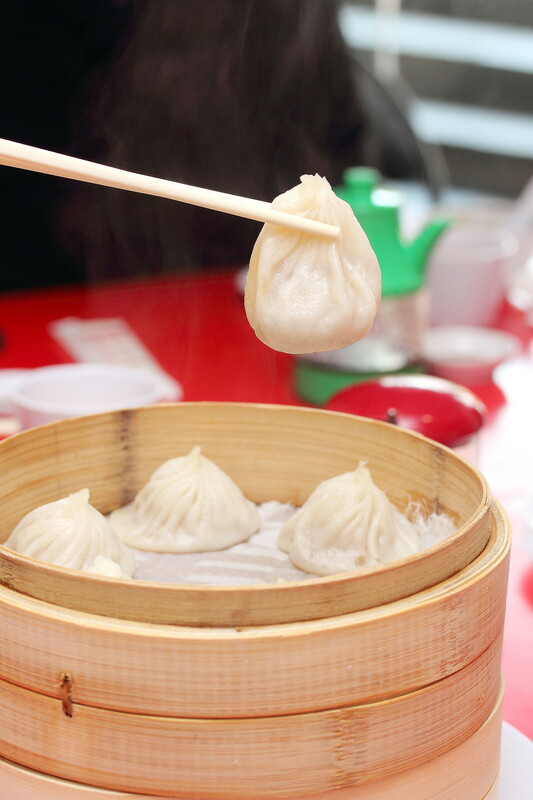 A good Xiao Long Bao does not break at the bottom that easily which most of our masterpieces did. 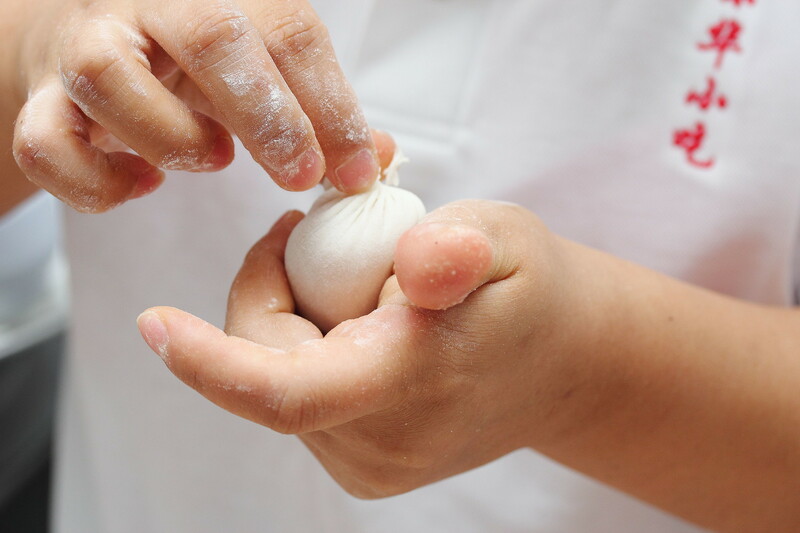 Guo Guang explained that the key when making the Xiao Long Bao is to be careful not to pull too much of the skin when making the fold on top which will cause the bottom to be stretched too thinly. As for the taste, as expected, the tender meat was flavourful but not oily which melted away easily in my mouth. 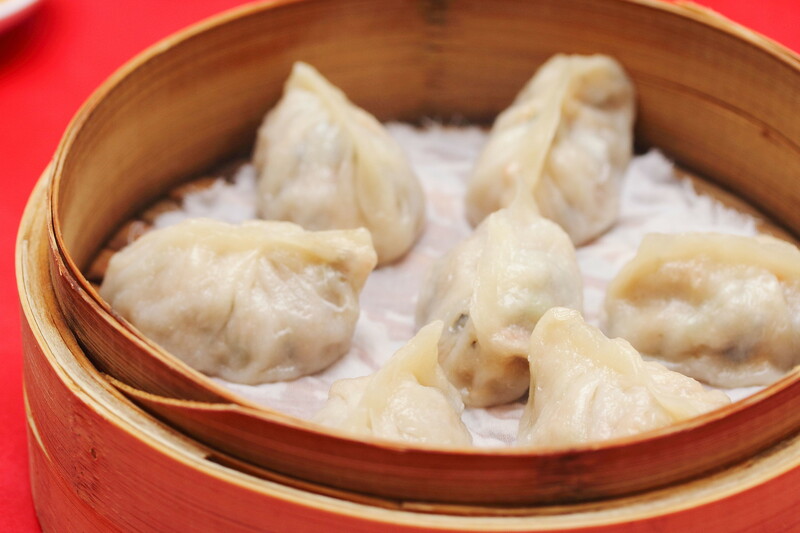 We tried another dumpling, Steamed Vegetarian Dumplings ($7++ for 7 pieces). I always feel that vegetarian food is not easy to prepare. Most tend to be overly seasoned which I feel is the case for this dish. 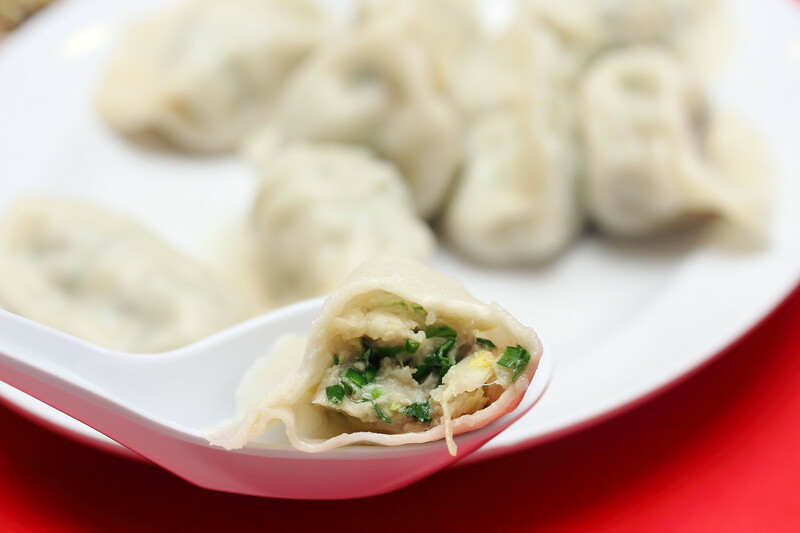 So, go for the real meat dumplings! The last savoury item we tried was Chinese Pizza ($10++). 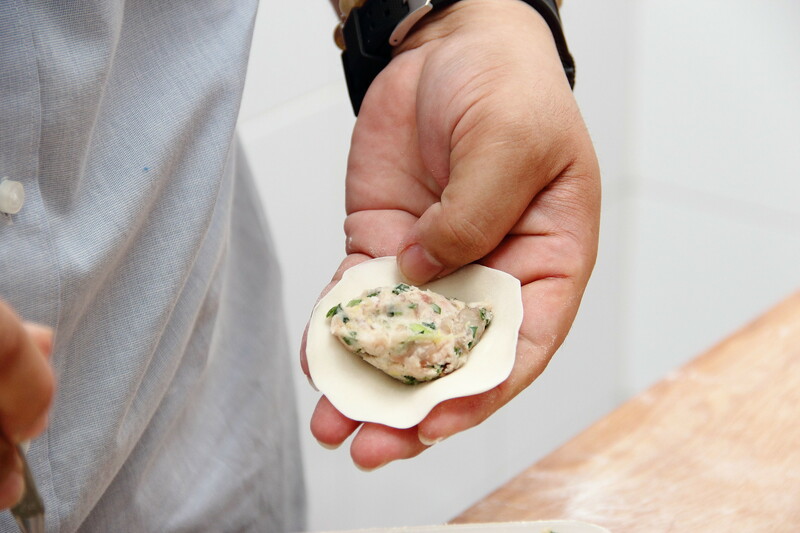 The filling used is the same as the mixed seafood and pork dumplings. Hence not much wow factor for me. I prefer those that looks like a smaller and flatter version of a calzone but filled with chives and bits of eggs. With the skin deep fried, the entire dish was too heavy for me. 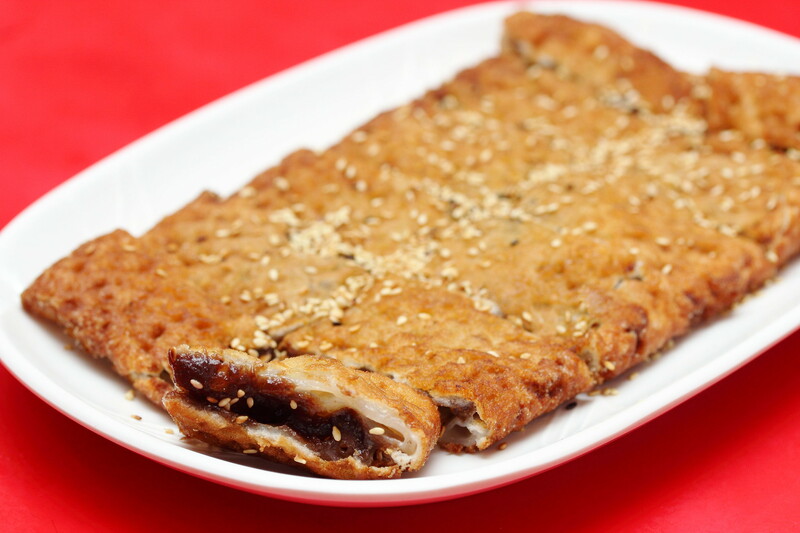 Towards the end of lunch hours, I could see plates of the Crispy Red Bean Pancake ($10++) being served. One of which belonged to us. As I bite through the outer crispy layer, my teeth sink through another layer of mochi-like texture before reaching the sweet red bean paste in between. At that instant, the post Chinese New Year food, fried nian gao (年糕) came to my mind. Wow, I didn't expect this dish to be that satisfying. It was warm, chewy, sweet. Another dessert we tried was Sweet Osmanthus Flower Rice Ball Soup ($3++). The look and the taste of it exude simplicity and honesty of a homemade dish. 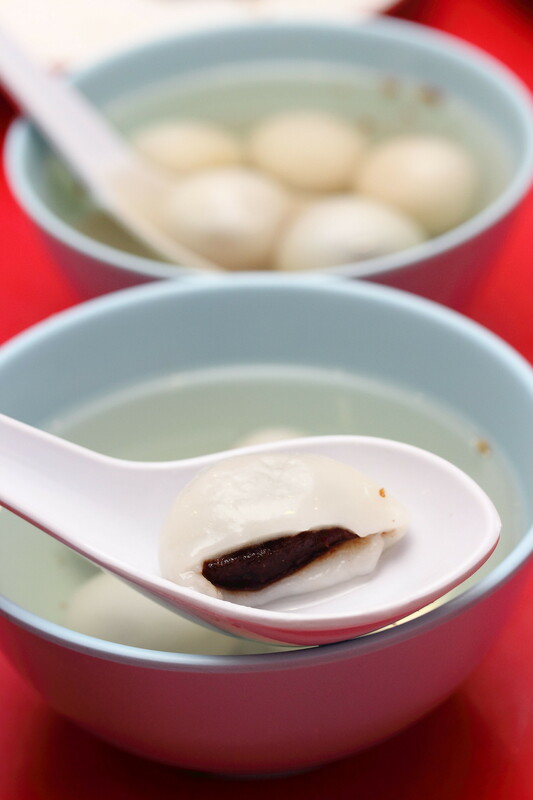 The rice balls were filled with peanuts, red bean paste, lotus and walnut paste, and black sesame. We had the mixed one but you can also request a specific combination of flavours. The osmanthus soup carried a tinge of sweet smelling aroma. I wish it was stronger with a much lower level of sugar to balance the sweet rice balls. As the F&B landscape gets more and more competitive, I believe that to uphold traditions and staying true to your original recipes is an uphill task. From today's meal, I could feel their commitment in doing so. After so many years in one location, Jing Hua now has a new addition at Rochor Road to continue bringing its Home-style Goodness to its regulars and garner new ones. We posted at about the same time! haha. Thank you. Maybe some editing will help. i love the red bean pancake! my favourite over there!